I have six weeks until I am in France! After nearly two years of working a boring desk job in a windowless room, I am almost ready to go on my European biking adventure. On June 10th, I’ll be flying into Nice, France. I’ll take a ferry to Corsica on the 13th, and on the 26th of August, I’ll fly back to New York City from Bilbao, Spain. Those are the only commitments I have. My plan is to bike along the Mediterranean coasts of France and Spain, to the Rock of Gibraltar, take the ferry to Morocco for a couple days, and then bike up the center of Spain, through Madrid, to Bilbao. I’ve been thinking about this trip for about a year and a half and am almost ready to go. I started learning Spanish in January with the Rosetta Stone. I can now say such useful things as ‘la mujer come una manzana,’ and ‘el gato esta sobre la laptop.’ I am going to have some great conversations. My touring bike should be ready next week and I’m ordering my racks and panniers. Now I just have to learn how to set up my tent in some actual grass rather than my kitchen floor, and maybe spend a night outside. I’ve only been camping once in my life and it was miserable. It was in July, and since the days were hot, I figured the night would be too. So, I only brought a sheet, unlike my more outdoorsy friends, who all brought sleeping bags. Needless to say, I passed a miserable, cold night, trying to get the nerve to walk the two miles back to my friend’s house. This time, however, I’m going to be more prepared. I bought a tent and a sleeping bag, rated to 40 degrees. I’m sure this will be enough for my nights on the Mediterranean. I’m also spending a lot of time on couchsurfing.org, trying to find people to stay with in big cities. I am in love with this website. It is so easy to use and I have already found a couple people that I can stay with around France. I’ve done two short tours before, one from Nice to Toulon, and one from San Francisco to San Louis Obispo. This is me while on my tour in France. Notice the u-lock and Kryptonite chain. I was used to riding in New York City, where anything not bolted down or locked up will be gone in a second. I didn’t realize Europe would be so much safer, and regretted having these heavy locks with me. I rode a fixed-gear that I borrowed from a guy I met in Paris. In California, I was a little more prepared, and took my Cannondale road bike. 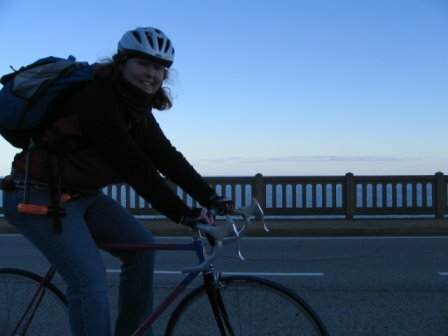 Riding along the coasts of France and California, I saw the most beautiful views I’ve ever seen in my life. I found my absolute happiness here. I didn’t think of what I was missing out on by being alone on the coast, I was just completely happy to be doing what I was in the moment. 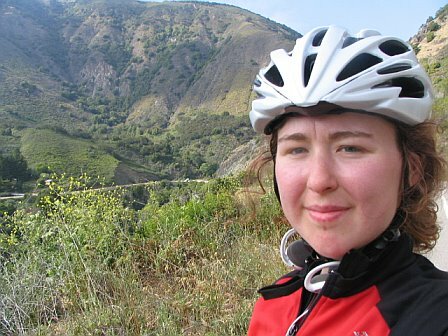 I’m really excited to be leaving in June and spending two and a half months biking in Europe! I hope you find your absolute happiness again on this trip.